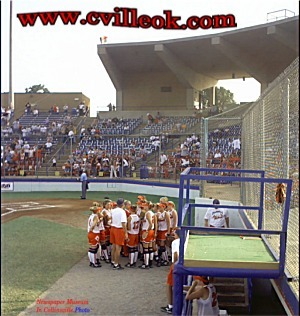 The Collinsville Lady Cardinal Softball team played in the large stadium of Oklahoma City's Amateur Softball Association Hall of Fame complex while several other (non-4A) games were played concurrently on smaller fields. Parking was scarce depending on when you arrived. Coach Stan Irvine told his team "there is no tomorrow if you don't take care of today" in this single elimination state tournament. 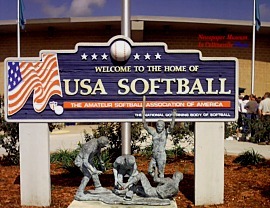 They did that by beating Dewey 4-0. 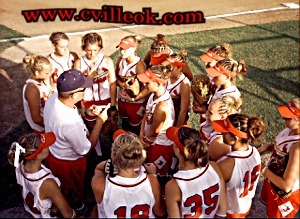 They face Deer Creek of Edmond at 2pm Friday Oct. 10th. Collinsville pitcher Kelli Dunagan (and teammates) shutout the Dewey Lady Doggers. My notes are incomplete, but I had at least 7 strikeouts down for Kelli. 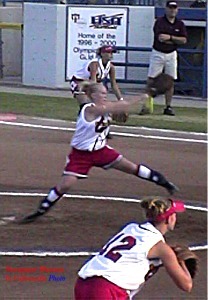 Erica Holly was hit in the leg by this pitch (before it flew upward behind her) in the first inning. Taylor Whisenhunt scored the first run of the game in the 3rd inning. In the photo above she is taking her lead off second just as Kelli Dunagan smacks the double that sent her home.